Birds Open Bottles And Catfish Hunt Pigeons When 'Darwin Comes To Town' Evolutionary biologist Menno Schilthuizen's new book is a breezy (sometimes too breezy) account of the ways animals have adapted to city life, and the staggering impact humans have had on evolution. In 1878, amateur naturalist Albert Farn wrote to Charles Darwin with some observations about the Annulet moth, which seemed to change colors to suit the differing landscapes of Britain. (Darwin never replied.) It's practically identical to the case of the famous peppered moth, where those with dark wings survived on the 19th century's sooty, de-lichened trees while their paler siblings perished. 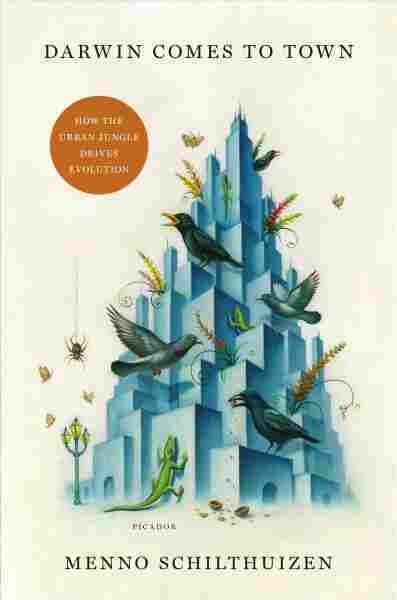 They're the textbook example of adaptation to urban conditions, and Menno Schilthuizen gives them their due in Darwin Comes to Town: How the Urban Jungle Drives Evolution. There's no denying nature's resilience, even — maybe especially — when the changes have occurred swiftly enough that traditional expectations about adaptation and evolution can't seem to keep up. Schilthuizen carefully picks his way through those particulars. (He's been interested in the idiosyncrasies of evolution for a while; his first book, Frogs, Flies, and Dandelions: The Making of Species, was published nearly 20 years ago.) But though there are few cut-and-dry conclusions there, one thing is clear: This isn't just about the adaptation of some clever species to a new environment — it's about a world in which there's no other option. Sure, it's fascinating (and terrifying/hilarious) that catfish in Albi, France — not a native species — have learned to hurl themselves out of the river to grab pigeons — arguably not a native species — from the shore. But other anecdotes can't help but suggest impossible loss. Urbanization is fraught, and the numbers can be staggering: "Of the original 208 square miles of rainforest that clad [Singapore] two centuries ago, when the Sultan of Johor allowed the British to pitch their imperial tents, less than one square mile remains." This isn't just about the adaptation of some clever species to a new environment — it's about a world in which there's no other option. Still, in a book so taken with nature's elasticity, maybe a little bleakness goes a long way — for every British hedgehog that starves to death after getting its head caught in a McFlurry lid, it's probably nice to know that urban birds in Mexico City line their nests with cigarette butts because nicotine deters mites. The threat we pose to nature is so self-evident that it is, on some level, beside the point. Instead, the book offers food for thought, and aims to give you new appreciation for the weeds in your driveway, the bugs in your porch lights, or the pigeons on your telephone wires. It succeeds; Darwin Comes to Town is a vivid portrait of a world changing to survive us.